Meet Jasper, our newest baby wombat. Let’s face it: baby wombats are pretty cute. Of all the marsupials out there, they are the one that get people swooning every time. But as we discovered in our recent profile of carer Linda, they’re also hard work to raise! 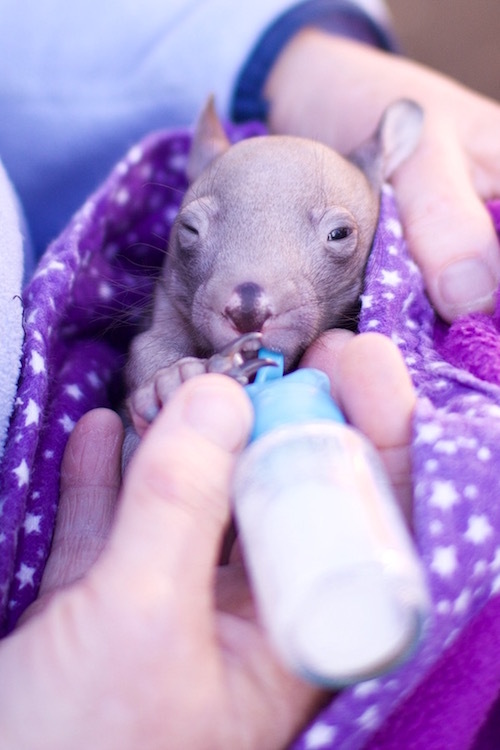 We thought we’d share the journey of one little wombat with you - from rescue to release, right here on this blog. It’ll be a multi-year process, but we’ll update you every couple of months. But let’s start with an introduction. Everyone, meet Jasper. Jasper came to Bonorong on the 24th of April 2016, after his mother had been hit by a car. Sadly his mum passed away, but a wonderful person had stopped to check her pouch (which is so important to do), and little Jasper was found. 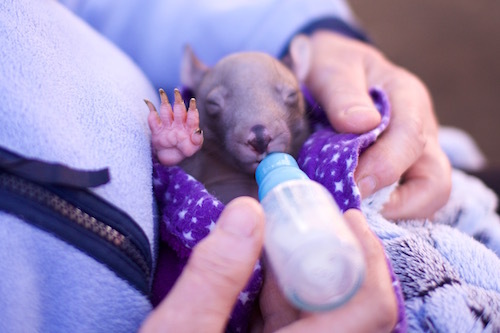 The first few weeks with a joey wombat are so important - and sadly not all joeys will survive the trauma of being separated from their Mum so soon. Jasper was lucky to be found early and placed with a registered and qualified wildlife carer (the lovely Linda), who has been giving him around the clock care. Weighing only 430g when found, he was estimated to be around four months old. At this age, Jasper had a little layer of fur on his ears, had just started opening his eyes and his lips were opening, allowing him to detach from his Mum’s teat. Since being with Linda he’s grown to a healthy 637g, has a fine layer of fur all over his body, and his lower incisor teeth have well and truly come through! (You can see the start of his upper incisor teeth in the photos). He is on 3-hourly feeds, which means Linda is up during the night to ensure he gets all the nutrients his little body needs. Jasper is truly a lucky little boy - and testiment to the importance of stopping to check the pouch if you do happen to find an injured or deceased marsupial. We’re looking forward to sharing more of Jasper’s development with you as he grows - keep an eye on our blog for more! Newer PostDo you dream of working with animals? Older PostShearwater season is underway!